In April, 2014, I gave a version of my talk: “Houses Never at Home: Fabric Dwellings and Wobbly Structures in Precarious Times” at the San Francisco Art Institute. 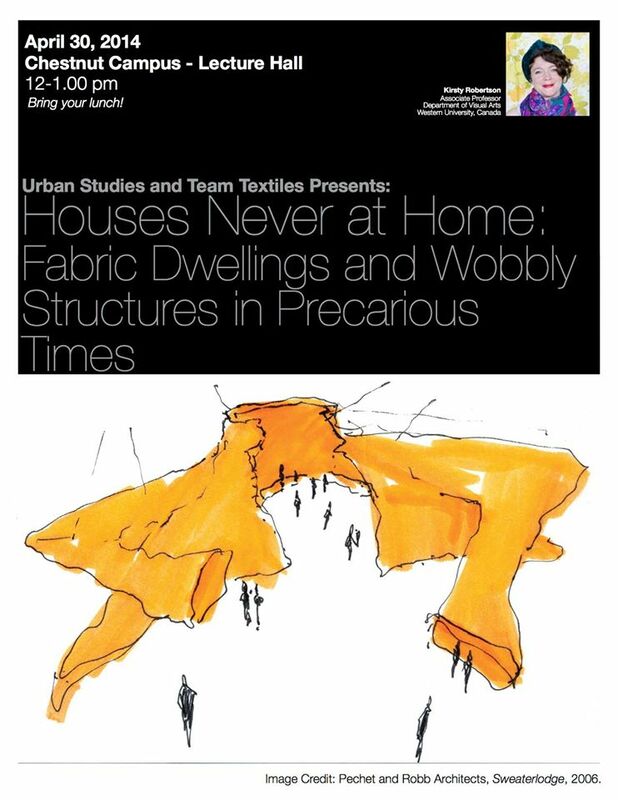 This talk examines textile homes, that is, tents, precarious housing, and “wobbly structures.” Moving from lo-tech handmade knitted houses to high-tech responsive membrane architectures, I consider how the utopian premise of many such edifices belies their actual contingency and fragility. Instead of reading textiles as comforting (an often automatic assumption), I instead turn to examples of textile homes, tents and buildings that illustrate threat, danger and upheaval. While home might be a place of residence and refuge, a conglomeration of affects, nostalgia and memory, it is also an idea and a physical entity seemingly constantly under threat from micro- and macro- stresses of daily living. Throughout the talk, I address how these shaky structures purposely or accidentally reveal problematics of precarity and discomfort under late capitalism.